On the heels of Wisconsin’s election results this past Tuesday, we are starting to see the potential true intent of the state voter ID law: vote supression. One former Republican staffer expressed his views about Republican giddiness about the voter ID laws and the opportunity to suppress the voting power of certain group. Then, on election night, we see an a Republican congressman–on the televised news!–explicitly state that the voter ID law will “make a difference” for Republicans in upcoming elections. Reports of any alleged voter “fraud” is just a red herring. We are seeing what many expected all along–the true intent of voter ID law is to eliminate certain voters and votes. What an undemocratic callous and insidious idea. If your party’s policy and positions do not hold enough weight to gain a majority of votes, let’s impose voter ID to gain an unfair advantage and suppress the vote. This entry was posted in Vote Supression, Voter ID and tagged Voter ID, voter suppression, Wisconsin elections, Wisconsin voting rights on April 11, 2016 by Charlie Domer. I’ve said several times in this blog that I view most news through the prism of a lawyer represented injured workers. 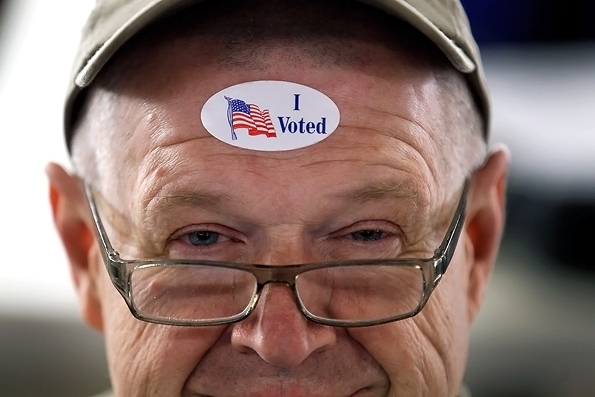 This morning’s headline noted “Democrats Reject Fraud Tales – Say Make Voting Easier”. Republicans have focused on the voter fraud issue in an attempt to limit voting from those who they assume will vote against them (employees, poor people, people of color). Republicans have resisted efforts at mandatory early voting periods and same day registration to make it easier to cast ballots. Their argument is eerily similar to the scare tactics employed by employers and insurers in worker’s compensation fraud. Studies indicate voter fraud throughout the United States is virtually absent. However, statistic belie these claims. Studies indicate voter fraud throughout the United States is virtually absent. In the same manner, employers and insurers routinely harp on the issue of employee worker’s compensation fraud (alleged malingering, etc.) and studies also indicate that employee worker’s compensation fraud is minimal at best (in Wisconsin studies suggest less than one-sixth of one percent). On the other hand, employer fraud (misreporting classifications of employees, classifying employees as Independent Contractors rather than employees) is rampant and costs the industry millions of dollars. This entry was posted in fighting fraud, Fraud, Insurance, Workers' Compensation and tagged elections, voter fraud, voter suppression on February 21, 2013 by Thomas Domer. This misleading billboard is scheduled to be taken down. In a follow-up to posts from last week, it looks like the “voter fraud” billboards are coming down in Milwaukee. It appears there were enough complaints about the actual intent of these billboards (voter suppression) to force them to come down. Unfortunately, who knows what effect the billboards had on the voting population while on display (note: as of last week, I noticed the billboards still up). Defenders of the billboards counter that the display was just stating the facts. Voter fraud is a felony. That is true and undisputed. No one is disputing the law or the facts. The issue is the underlying intent. The facts have long-revealed that voter fraud is a virtual non-issue. This is a scare tactic to intimidate and, more significantly, to confuse voters (the billboards are meant to look intense). If they keep one voter from heading to the polls, they have (unfortunately) served their insidious purpose. Glad they are coming down. This entry was posted in Government and tagged 2012, elections, Milwaukee, voter fraud, voter suppression on October 25, 2012 by Charlie Domer. This follows last week‘s post about voter suppression efforts in Milwaukee. The more surprising aspect of this article is the concern for voter fraud in swing states (like Florida, Ohio, and North Carolina). Apparently, and despite the actual evidence, voters seem to believe that the other political party may engage in fraudulent tactics in the upcoming election. Sixty-eight percent of those identified as “very liberal” believe that GOP will commit voter fraud to help Mitt Romney. Likewise, sixty-three percent of those identified as “very conservative” believe that Democrats will commit voter fraud to help President Obama. This level of paranoia is shocking. As with many things in modern American politics, the facts do not seem to matter. This entry was posted in Government and tagged 2012, elections, Milwaukee, voter fraud, voter suppression on October 22, 2012 by Charlie Domer. A billboard in Milwaukee could lead to a lower turnout on election day. I’ve noticed a number of billboards in my city that have gone up in recent weeks (please see the Milwaukee Journal Sentinel story here: http://www.jsonline.com/news/milwaukee/community-groups-object-to-voter-fraud-billboards-5077qis-174260461.html). 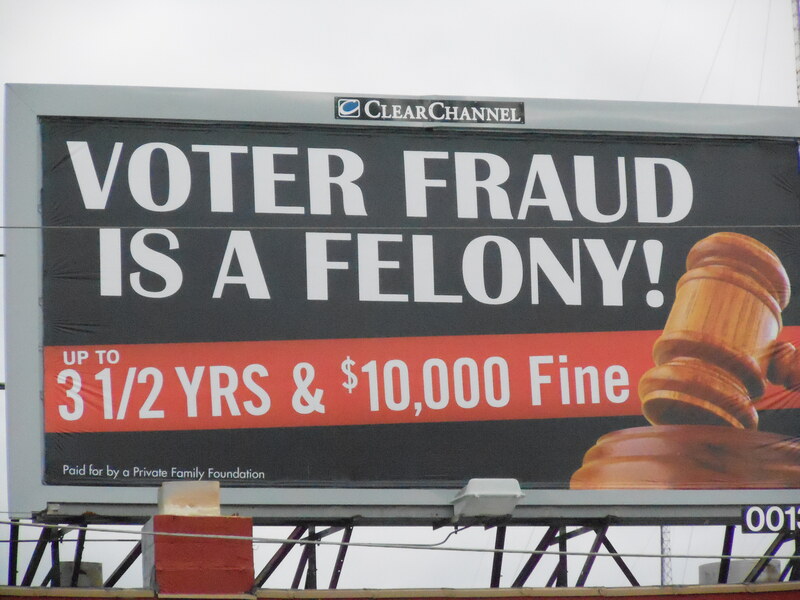 These billboards state that “voter fraud is a felony,” and they appear to be “strategically” placed in certain neighborhoods. My level of outrage and frustration increases with every single viewing of these misleading and outrageous billboards. First, I can’t believe that the person/family/corporation responsible for the billboards can’t own up to identifying who they are. The ads are simply sponsored by a “private family foundation”—a great way to hide the true identity. Also, the message is truly insidious, as the allegations of voter “fraud” are just a red herring. The reality and intent of these billboards is for one purpose: voter suppression. The goal is to create some unfounded fear to keep certain individuals from voting in the upcoming election. 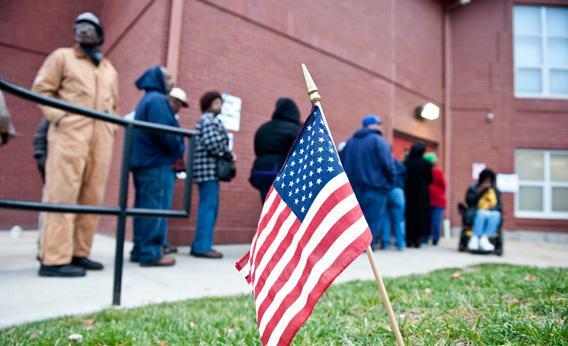 One of the main tenets of a vibrant and representative democracy is the right to vote. I am truly disheartened by the fact that certain people or political parties feel that their only route to winning an election is to suppress the vote. This entry was posted in Government and tagged 2012, elections, Milwaukee, voter fraud, voter suppression on October 18, 2012 by Charlie Domer.